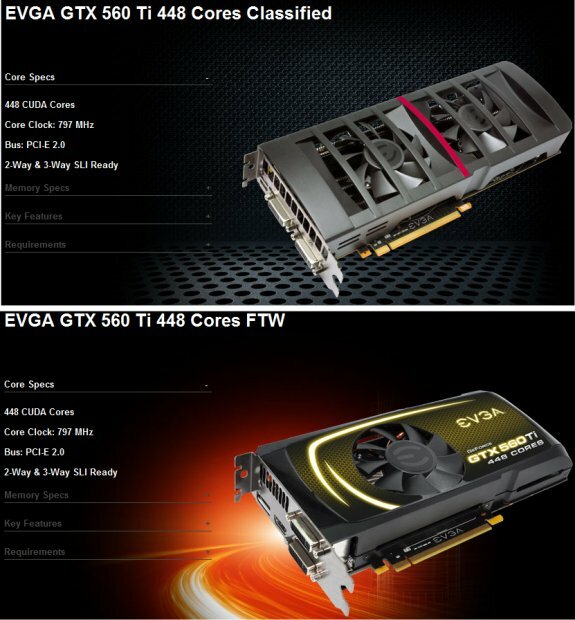 EVGA delivers the GTX 560 Ti 448 Cores Classified and GTX 560 Ti 448 Cores FTW graphics cards. The Classified edition offers a dual-fan cooler, with a 797MHz core, 1584MHz shaders and 1280MB GDDR5 memory clocked at 3900MHz. The FTW edition has the same frequencies but a less advanced cooling solution. Pricing is $299.99 for the Classified and $289.99 for the FTW.